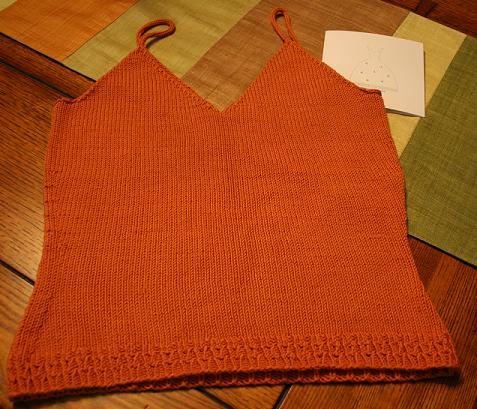 I was all set to knit myself a Honeymoon Cami in preparation for my very own luna de miel, but Alison made one for me! It's so soft and silky, the color is so *me*, and the fit is just right. And while I would have loved it even if I weren't a knitter, the fact that I've made this same cami before gives me an added appreciation for the waist shaping and lovely lace edging. It's taking all of my powers of restraint not to wear this now, in the hot, waning days of summer -- but it's a Honeymoon Cami for Pete's sake, and I think it should make its world debut in Spain. So no pictures yet, though nothing can stop me from taking it out almost every night and fantasizing about the Alhambra and flamenco. Could she be any more thoughtful? That was so thoughtful of Alison to make the Honeymoon Cami for you. And extra yarn, so sweet! When's the big day for you two? I can't wait to see the honeymoon cami's debut in Spain. Such a beautiful place. Where will you two be honeymooning? I went to Spain for "mi luna de miel". Three weeks of enjoyment. La Alhambra is an amazing place to visit. Wear your Cami when you see a flamenco (hopefully in Seville!). The color is just perfect! Yay! That cami is so cute - you are a lucky woman. Have a wonderful honeymoon. I'll be waiting with bated breath for the pictures! So thoughtful of Allison! It looks beautiful! Wow, what a beautiful color!! I've never been to Espana but I feel like that orange will match everything there. :) Have a great trip! !